Adjust oven rack to middle position, heat oven to 350 degrees F. Lightly grease two 9-inch round cake pans; set aside. Mix sugar, flours baking soda and xanthan gum into a large bowl, then whisk to combine. Cut in the vegan butter, making a crumbly mixture. Combine coconut milk, vinegar and vanilla in medium size bowl and add this mixture to dry ingredients. Mix well, batter will be thick. Pour in hot water, 1/4 cup at a time and mix well. The batter should be thicker than a standard cake batter, not runny. Fold in shredded coconut. Divide batter evenly between cake pans. Bake until toothpick inserted in center comes out clean, 20 to 25 minutes, switching position of and rotating pans after 12 minutes. Cool cakes in pans on wire rack to room temperature, about 2 hours. Sift powdered sugar, removing any clumps. 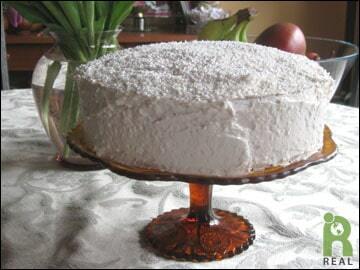 Blend vegan cream cheese, almond and vanilla extracts and sugar with a fork, whisk or beater. Beat at low speed until smooth, do not overbeat. Add additional sugar to taste. Let chill several hours. Frost top of one layer, place the other layer on top and cover with frosting. Add shredded coconut to top and sides by gently tossing it onto the frosting. Coconut that does not stick can be pressed into the frosting with a knife.